My Digital Camera Software Is Not Detecting The Camera? If you are having problem when connecting your camera to your PC for the intention to transfer the images in your memory card to your computer’s hard drive but found out that your PC is not detecting your camera at all even you have connect them with the right cable to the right connector. When you are having such problem and having no idea on what to do, there are actually something that you can perform to find out whats actually going wrong. You should check if you have the proper driver install in your PC. When you purchase your camera, it will comes with a CD that contain the user manual and driver of your camera mode. Try to install the driver to the computer when you are having your camera connected to the computer. If you have installed the driver previously, try to uninstall and reinstall again with the camera connected to the computer. Of course, sometime we can tend to be forget thing. So the other thing that which may seem to be minor but can be the cause of your camera not being detected by your computer is you forgot to power on your camera even it is connected to the computer. Some people will think that they can just connect the cable to the USB connector of the computer as the USB will bring the power to turn on the camera. However, most of time this will not be the case as the power of USB is limited and it may not be enough to power on your camera. Therefore, it is best that you check your camera is power on. If not power on, you can just power on with the power adapter so that the power can be constantly supply to the camera. Also, a digital camera is normally get detected the same way as a flash card. If proper connected, the device will show up as a device in My Computer under the heading Scanners and Cameras. In case you are able to go that far but not any further, try to check and see if the camera batteries are running flat. If there are still power for the batteries, then you should try to reinstall your camera software. While reinstall your camera software, you may check on the Digital camera listing in my computer. Double click on the camera icon as if you were pressing on any other folder. You will find that all the images are going to get displayed. You can then try to select all of them and copy to any folder. Once this is done, you can just delete the images from your camera as you’d delete any other file. And if there is some kind of Autorun in which you are expecting but not happening or the software simply not able to cope with the computer and camera? If that is the case and you wish to get something done to make it works, you can try to turn everything off including your computer and turn back on after couple of seconds. Besides, you can try to connect your camera to other PC or laptop that you have to see if it can get detected. If problem persists, then it is best for you to bring your camera back to the shop that you bought it and have them to check for you if it is still under warranty. The Canon EF-S 18-200mm f/3.5-5.6 IS Lens functions an amazing focal duration variety (1 that totally covers the requirements of numerous photographers) and an excellently-performing IS program inside a nicely-sized entire body. A compact one-lens-does-it-all answer is perfect for numerous vacation requirements. The Canon EF-S 18-200mm f/3.5-5.6 IS Lens’ arrival was timed nicely with a number of my personal vacation plans – The 18-200 and also the also new-at-the-same-time Canon EOS 50D accompanied me to Acadia National Park (Maine, USA) and to New York Town. These trips gave me a really great chance to place the mixture to utilize within the area together with standard use close to house and testing within the studio. As you may anticipate, the focal duration variety may be the large attraction for this lens. Use the mouse-over labels below the focal duration comparison picture beneath to obtain an concept from the variety of focal lengths this lens covers. Some people wish to capture all of their memories and experiences (and nevertheless have really great high quality pictures) without having the burden of carrying a backpack full of lenses (along with a tripod). And you will find times when carrying a backpack and tripod isn’t practical as well as feasible. For these individuals and these circumstances, the Canon EF-S 18-200mm f/3.5-5.6 IS Lens is an excellent option – an excellent vacation lens. This kind of was the scenario with my previously pointed out journey to New York Town – company was the main objective from the journey. The 50D and 18-200 inside a Believe Tank Photo Digital Holster 20 went with me everywhere and had been not a burden. I came back with some good pictures in the journey. 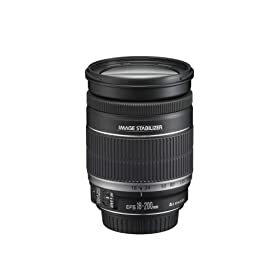 The Canon EF-S 18-200mm f/3.5-5.6 IS Lens provides an excellent focal duration variety and superb picture stabilization inside a compact package. You will find likely to be a whole lot of individuals traveling with this lens. And in the exact same time, the Canon EF-S 18-200mm f/3.5-5.6 IS Lens like a kit or common objective lens can make a whole lot of sense. The comfort worth of this lens is really higher. Do you know your IS from your VR (Vibration Reduction) and understand the main types of vignetting? Can you spot a converging vertical? No? Then read our ultimate lens Frequent Asked Questions. From the outside they look simple enough, but what’s really going on inside your camera lens? Well, a lens can house up t0 20 or so individual lenses in a dozen or more groups, Other moving parts include the aperture blades, which are often curved to give more pleasing depth of field effects, and an autofocus motor. Then there are all the electronics needed for communicating with your camera. Clearly, DSLR lenses are anything but simple devices, but you don’t need a PhD in optical engineering to understand how to get the most from them. 1. Why is there such a huge price different in lenses? Expensive lenses generally deliver much better optical quality than cheap models, because they usually include advanced low-dispersion glass, highly customized aspherical elements, exotic coatings to reduce ghosting and flare, and are manufactured with greater precision to deliver the very best standards of image quality. In addition, professional zoom lenses tend to offer faster maximum apertures, which remain fixed throughout the zoom range and are referred to as ‘constant aperture’ lenses. These will also have a much more rugged and robust build quality, capable of standing up to demanding use on a daily basis. They often feature splash-proof and dust-resistant seals, too, so they can be used in any weather conditions and survive the consequences. 2. what is the ‘sweet spot’ of a lens, and how do I find it? Practically all lenses fail to give their sharpest detail and greatest contrast when shooting ‘wide open’ at their maximum apertures. To achieve the best image quality possible, it’s usually best practice to ‘stop down’ by two or three stops so, for example, with a lens that has a maximum aperture of f/2.8, you would shoot at f/5.6 or f/8. To find the sweet spot of your lens, take a series of test shots throughout the whole aperture range and bear in mind that, for zoom lenses, the sweet spot aperture may be different at varying zoom settings. When reviewing the results, you will probably notice that while the quality initially increases as you start stopping down, it will decrease again at very small apertures, such as f/22 or f/32, due to the effects of diffraction. 3. What is ‘fall off’, and how do I avoid it? There are three main types of vignetting associated with camera lenses, each of them producing images that are darker towards the corners than in the center of the frame. With optical vignetting, light entering the lens from directly in front of the camera illuminates all elements equally, whereas elements towards the rear of the lens are more shaded from light entering at an angle than the front elements. Optical vignetting can be overcome by reducing the aperture from its largest setting by two or three stops. Mechanical vignetting is common when using very wide-angle lenses, where the corners of the field of view are physically obscured by objects such as thick screw-in filters or lens hoods that extend too far in front of the lens. You can normally cure the problem by using screw-in filters that have an ultra-thin construction! and by using petal-shaped lens hoods that are specifically designed for the lens. Natural vignetting, also known as ‘fall off’, is a function of the light from the lens striking the sensor at more extreme angles in the corners, compared to being more direct in the center. This is more of a problem in compacts than DSLRs, and can be corrected in image-editing programs. 4. What is the slowest shutter speed I can use when hand-holding my camera? The rule of thumb is that the slowest shutter speed you can use without suffering from camera shake is the reciprocal of the focal length. However, this is for full-frame cameras, so with most DSLRs, you also need to take the crop factor into account. For example, most Nikon cameras have a 1.5x crop factor, so a 60mm lens will give an effective focal length of 90mm. This means the minimum shutter speed you would use is 1/90 sec, rather than 1/60 sec. Shutter speeds rarely tally exactly with focal lengths so, where a 70mm lens would be equivalent to 105mm, it’s best to err on the side of caution arid use a minimum shutter speed of l/125 sec. 5. How do I stop my lenses steaming up and clear the moisture when this happens? Steaming up is caused by a sudden change from a cold environment to a warm one. For example, if you leave your camera in the boot of your car on a cold winter’s night, then bring it into a warm building in the morning, the outer surfaces of the camera arid lens can be covered in moisture almost instantly. The best plan is to apply temperature changes gradually, but if this isn’t possible, simply leave the camera to come up to the ambient temperature naturally. If you really can’t wait, use a clean cloth to gently wipe the front lens element, using a circular action. The danger here is that if there’s any grit on the lens you could easily scratch the element, so for safety’s sake, have a screw-in UV filter fitted permanently. 6. What is chromatic aberration? This is also called ‘color fringing’, because it produces either red/cyan. blue/yellow or even green/magenta fringing, which is a mix of the two colors around an image’s high-contrast edges. It is caused by the lens focusing different wavelengths of light at different points, either at varying distances along the path of light (longitudinal) or shifted in a transverse direction (lateral). To reduce chromatic aberration, manufacturers typically combine pairs of elements that have different refractive indexes. called ‘achromatic doublets’, which work together to cancel out refraction. High-quality lenses also often include elements made from specialized hybrid glass to minimize the dispersion of light, such as Nikon ED (Extra-low Dispersion) and Canon UD (Ultra-low Dispersion) glass. 7. What are ghosting and flare? And how can I avoid them? These are effects caused by stray light bouncing around inside the lens, reflected between the various elements and the inside of the lens barrel. A loss of detail and color as well as the creation of ghost images are most commonly caused by intense light sources within the field of view, or close to its periphery. The most effective solution is to avoid shooting into the light, but this isn’t always possible. For example, when shooting portraits on a sunny day, it’s common practice to position subjects with their backs to the sun and to use fill-in flash to illuminate their faces. Ghosting and flare can then be a huge problem so, in scenarios such as this, high quality lenses come into their own, featuring highly specialized coatings not only on the front element but also on internal elements to minimize the effects. The best way to reduce ghosting and flare is to fit a lens hood, which cuts out extraneous light falling onto the lens from an oblique angle. 8. Why would I need to use a prime lens? Zoom lenses are wonderfully convenient and versatile, but unfortunately there’s almost always a compromise to be made when it comes to image quality. Common degradations include barrel and pincushion distortions, increased chromatic aberrations and vignetting at the wide-angle end. Prime (fixed focal length) lenses typically suffer much less from these unwanted attributes, as well as delivering sharper images into the bargain. Another bonus is that prime lenses usually offer larger maximum apertures, being referred to as ‘fast’ lenses, because the bigger apertures enable faster shutter speeds. This is extremely useful for avoiding camera shake under dull lighting conditions, so there is less reliance on flash, as well as for freezing the action and avoiding motion blur. Another bonus in portraiture is that large apertures tend to give a smaller depth of field, which makes it easier to blur any distracting backgrounds and focus the attention on the subject instead. Tokina 11-16mm lens create a riot in the market for the reason that the lens is inexpensive and come with many astonishing features. If you are frequently keep a keen eye by monitoring the lens market, then it is easy for you to fall in love with this Tokina 11-16mm lens. For professional photographers through their extensive research may well help them to establish firm believe that Tokina 11-16mm lens can be the best among the camera lens available on the market that provide good performance quality with low price. And the main highlighted feature of this lens is its fastest ultra wide angle lens. Tokina 11-16mm lens might not really look good to buy for most users when they first observe the lens as most of the users are having certain believe that third party lens is not able to beat the original manufacturer lens. However, most of them soon will find they can be quite wrong with such judgment as Tokina 11-16mm able to prove itself to be the best lens that can produce high quality shooting. Some of the cool specifications are includes of minimum focusing distance of 11.8in. (0.3m); filter thread of 77mm, and weights around 560g; the 104 – 82 degrees Angle of View; the lens is able to mount for Sony, Nikon, and Canon camera. Most users are going to love the AutoFocus feature which enables the Tokina 11-16mm lens to auto adjust and focus on the targeted subject. In addition, the f/2.8 aperture is undoubtedly a wonderful feature for you to have in a ultra wide angle lens. Tokina 11-16mm lens is going to work for you completely in spite of its zoom range limitation factor of 1.45x. And you should know that each lens on the market has their disadvantages but this specific lens is close to perfect with the top notch performance. As a result, It is highly recommended for you to buy this lens if you want to shoot for high quality pictures. However, there is something that you need to aware of which is you shouldn’t use this Tokina 11-16mm lens with a full frame DSLR camera as it is created for you to use with cropped sensor DSLR. Big, weight and tough, the Tokina 12-24mm has almost battleship-like build quality and is available in Canon and Nikon fit options. Either way, the maximum effective wide-angle focal length is unimpressive at 19.2mm and 18mm respectively, compared with own-brand lenses, which work out at 16mm for the Canon and 15mm on the Nikon. The Tokina is currently available in Mark I and Mark II guises, the latter model being about $200 more expensive to buy, with a street price of $700. ON the face of it, since both lenses look pretty much identical and operate in exactly the same way, this makes the Mark I look something of a bargain. The only critical difference is that the Mark I version of the Nikon-fit lens does not have a built-in Autofocus motor, so it will not Autofocus on the D40, D40x or D60. The Mark II also feature a new optical coating, which Tokina claims is more effective at reducing ghosting and flare. Like the Sigma and Pentax lenses, and in keeping with its Pro label, the Tokina has a constant maximum aperture, which remians fixed at f/4 throughout the zoom range. As you will see from the results of our lab tests overleaf, the Tokina lens acquits itself pretty well in terms of optical quality. One caveat that is worth noting, however, is that we frequently suffered blue color fringing when shooting at large apertures in the wider focal length range, not only towards the corners of the frame but across the whole image. – Although sharpness drop-off between the center and edge of the frame was low, the influence of chromatic aberration is felt at 12mm. – There is no full-time manual override, but at least the push-pull focus ring makes it easy to snap between autofocus and manual focus. – Center sharpness is good at 12mm, but it falls off towards the edge. At other focal lengths it performs well, with sharpness dropping slightly. – Heavy blue aberration is apparent towards the outer edges at a focal length of 12mm, but this decreases at increased focal lengths. – At 12mm, the barrel distortion is quite apparent, but as you move through the focal range the distortion reduces in tandem.